Enjoy our exclusive offers and promotions on your stay at the Hotel Le Clos Saint Martin in Sancerre. Romantic week-end , oenotourism, if you want more informations, please contact us at the hotel. 1 Night at the hotel with breakfast, a visit de la Perrière and visit of the museum : la maison des Sancerres. Staying in Sancerre cannot be done without discovering all its wines or visiting its cellars. The Saget la Perrière House, owner of different domains invites you to explore its mythical domain : La Perriere. During this visit, you will enjoy a wine tasting of its different Sancerre cuvées done by the domain. This oenotouristic trip in the heart of Berry will please the lovers of good wines and of the vines. Book 2 nights in Classical Room with breakfast, 3rd Night offered. You’re coming by Sancerre, for holidays or for business, you would like to enjoy the charm and calm of a country hotel ? The Hotel Le Clos Saint Martin makes you a week-end offer : Book 2 nights and the 3rd one will be offered, with breakfast included. Sancerre is a nice destination for a week-end at 2 hours only from Paris. One night for 2 people – One bottle of White Sancerre of the domain La Perriere offered – with breakfast included. Come and enjoy the charm of our Hotel ***, for a romantic night in the countryside of the Loire Valley. Our Hotel, located in the heart of the famous village of Sancerre, is a great place to enjoy the typical sweet life of the Berry. Let’s get lost in the steep alleys of Sancerre, and admire the superb panorama, savor the local meals, look at the beauty of our Loire and its banks of wildlife, taste the Sancerre and Pouilly wines on the terraces of the local cafes, or in one of the numerous cellars where local and passionate winemakers will make you dicover their wines. 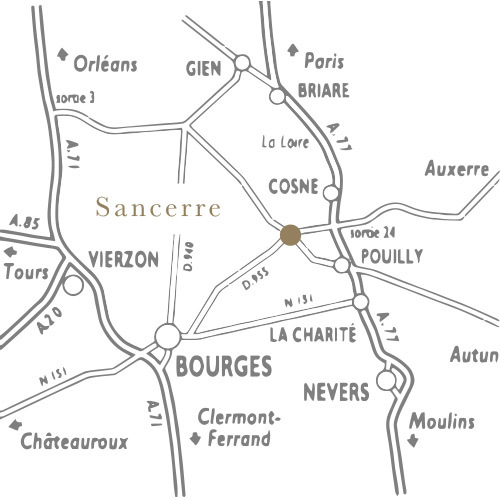 Sancerre is a calm and romantic destination at 2 hours only from Paris, for a relaxing stay.